A problem of many air conditioned environments is the missing user feedback. An individual's "perceived temperature" is not accounted for by most climate controls. In some applications (e.g. luxury cars) infrared sensors are used to measure a drivers' skin temperature to assess his thermal comfort. However, it is known, that wind chill effects can make people feel cold, even when ambient temperature remains unchanged. Therefore, skin temperature measurement alone is no reliable source to assess thermal comfort of human beings. However, sweating is an excellent indicator of thermal comfort. The main purpose of sweating is body thermoregulation. A perspiration sensor represents precisely, whether a person feels hot or cold. 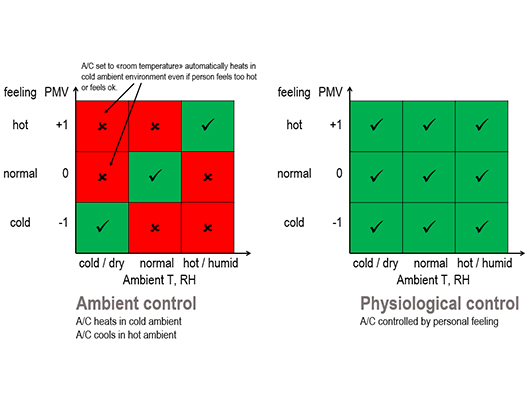 An A/C using individual perspiration as input parameter can control climate exactly for optimal comfort feeling without knowledge of the previous activity level of the user. A "thermal comfort sensor" could measure people's comfort and the A/C could adjust so called Predicted Mean Vote (PMV) levels accordingly. The PMV model was developed in the 70s by Danish scientist Ole Fanger. The PMV-index indicates the mean thermal comfort feeling of a group of people in a standardized setting on a seven-point scale from cold "-3" to hot "+3". The ideal comfort value is at "0" and the thermal comfort zone is defined within the PMV limits -0.5<PMV<+0.5. 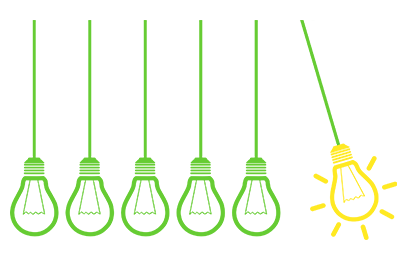 An A/C operating without user feedback, will heat, if the room temperature is below the set-point and will cool, above the set-point, independent of the “thermal comfort”of the user. If an user feels warm, for example due to physical activity, he might not require A/C heating, even if the room temperature is below the set-point. A room occupant might feel cold and shiver due to fever even at high room temperature. Nevertheless, the A/C would cool down the room. Only an A/C with user feedback would heat and cool correctly according to the user’s thermal comfort level (Figure 1). 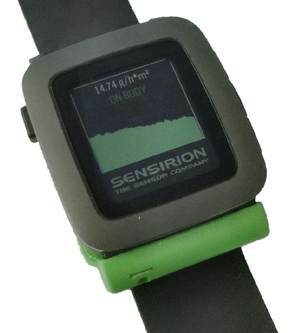 Sensirion proposes a "perspiration sensor" as fair representation of a person's thermal comfort (Figure 2). The principle is well known for skin moisture measurements. 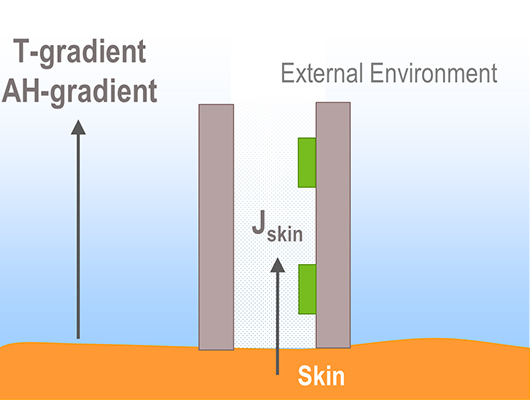 The so called transepidermal water loss (TEWL) is the water that passes through the skin and evaporates from the surface in order for the outer cell layers to remain sufficiently moisturised. 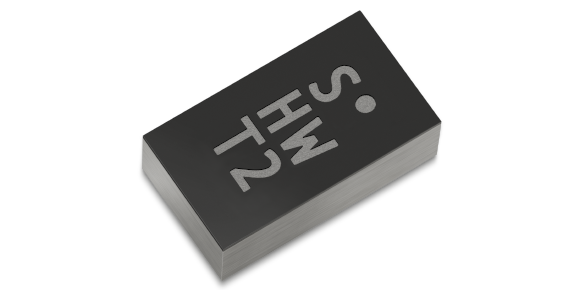 Sensirion uses two of its tiny SHTW2 relative humidity and temperature sensors in a channel to measure perspiration (Figure 3). An example of perspiration rate measurement for different activities is presented in Figure 5. The measurements demonstrate that a perspiration sensor is a good indicator of a person's thermal comfort feeling. Please refer to the perspiration application on our developer website for more information on how to design a perspiration sensor.